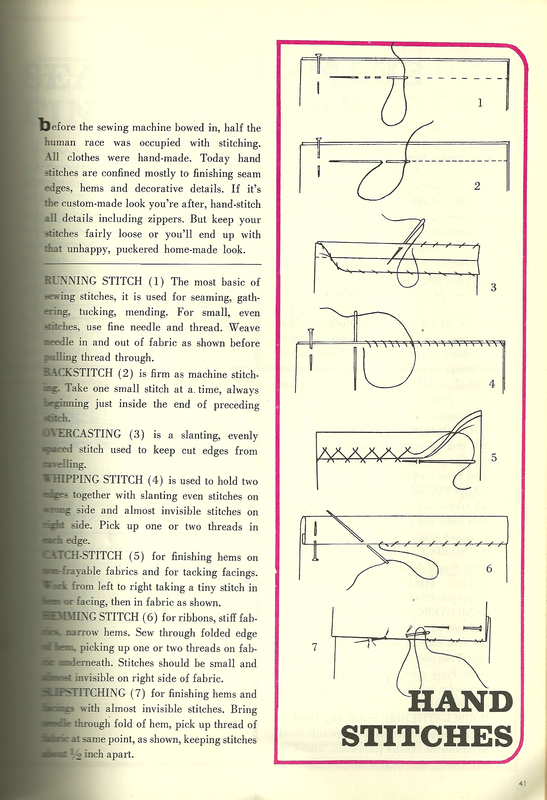 Sewing in 1958: including tips and new ideas even for the experts! This is just one page of many detailing stitches and seam finishes. 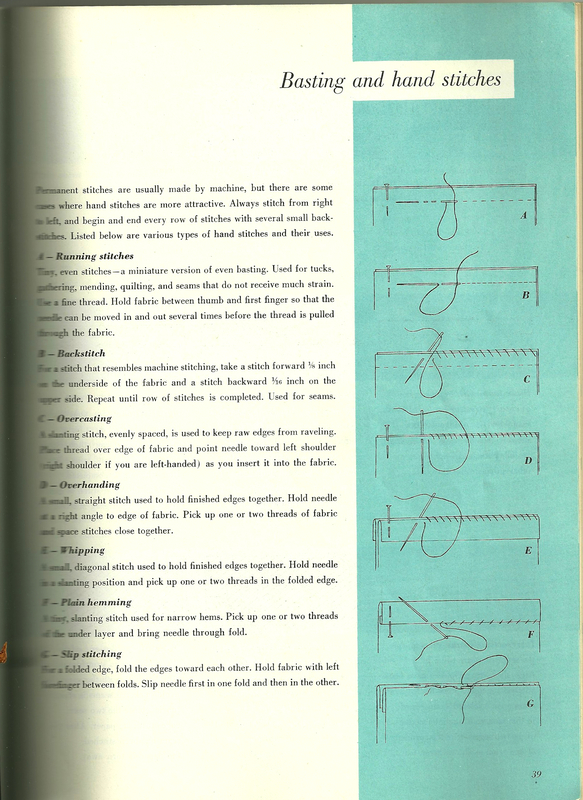 Five years later, another article in Vogue Sewing Book, c1963, The Butterick Company, Inc., featured the same basic stitches. It seems there can never be too much of a good thing, as evidenced by a February/March 2008 article in Threads magazine, by Kenneth D. King, entitled “Master the Hand Stitch: Learn the fine, invisible stitches that are the hallmarks of couture sewing.” This article is especially informative, with photographs and expert tips, all of which serve the modern amateur dressmaker so well. 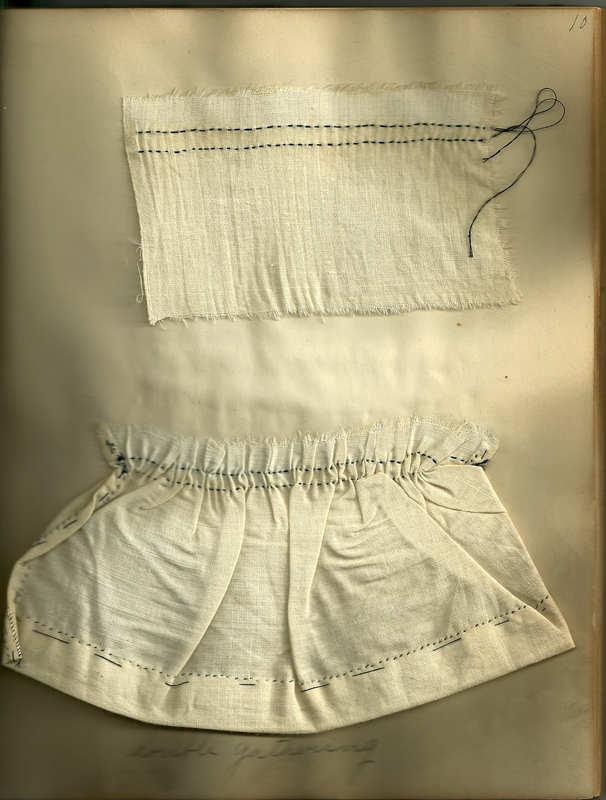 So – how did our grandmothers and great-grandmothers learn the stitches and sewing techniques that are so readily available to us? 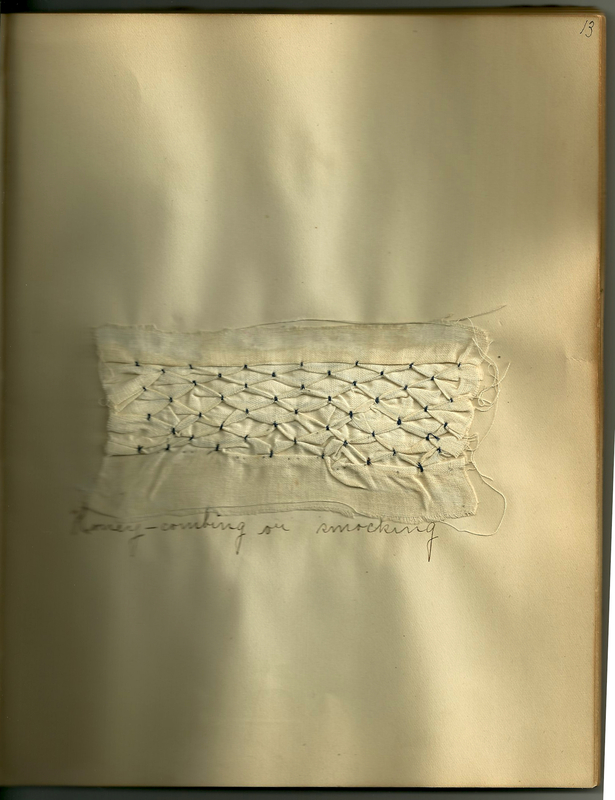 Many of them made their own sewing/stitching “example” books in “finishing school”. My husband’s grandmother was one such young woman. 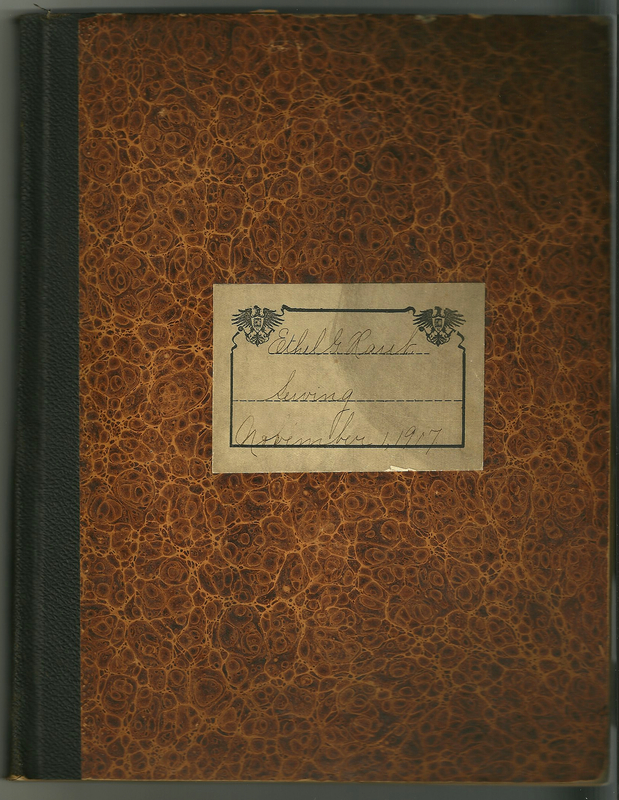 I am so fortunate that her “Sewing” book, dated November 1, 1907, is in my possession now. She would have been fourteen years old in late 1907. 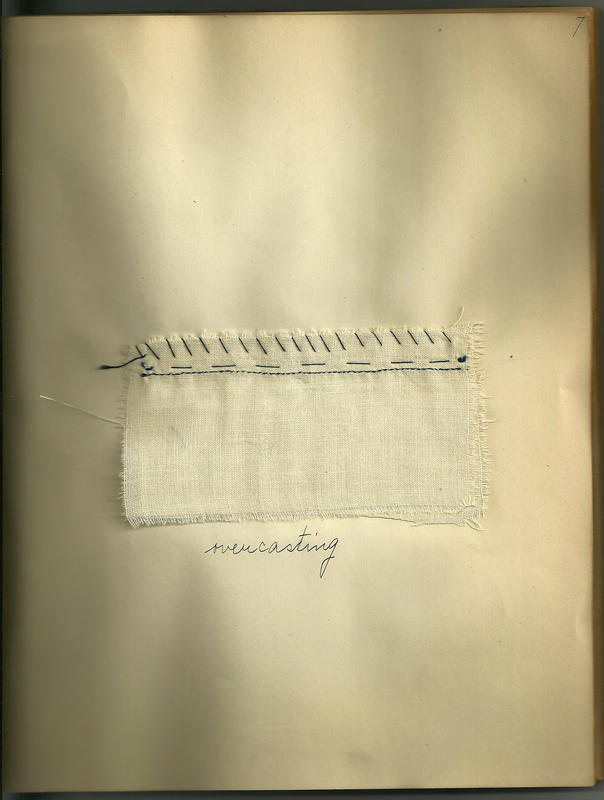 There is a label inside the book which tells me that she purchased this book of blank pages at L. B. Herr, Bookseller, Lancaster, PA.
Ethel filled her book with 35 pages of examples of stitches, types of seams, and sewing techniques. Every example was made by her, with a brief description in her handwriting. Here are a few pages from her remarkable book (click on the photos to see them up close). 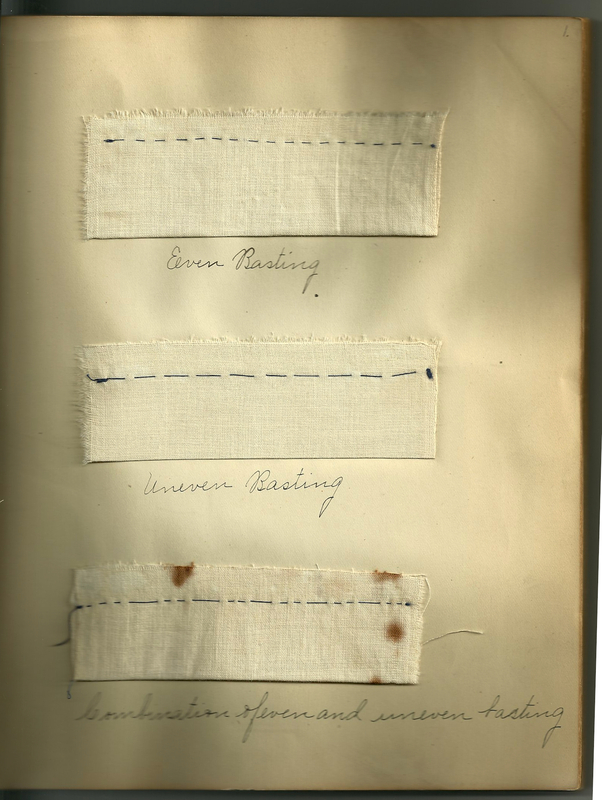 Basting stitches – three kinds! 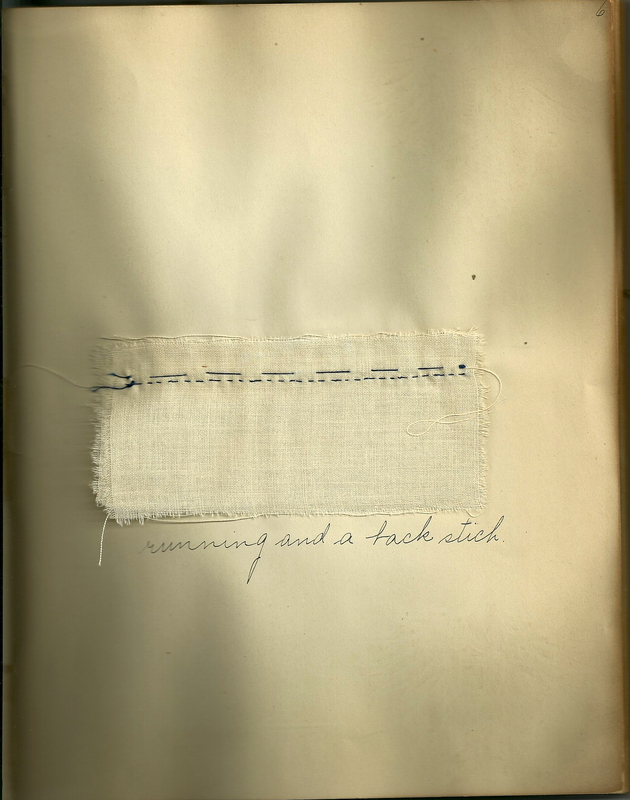 Running and a back stitch – notice that she spells it “stich”. 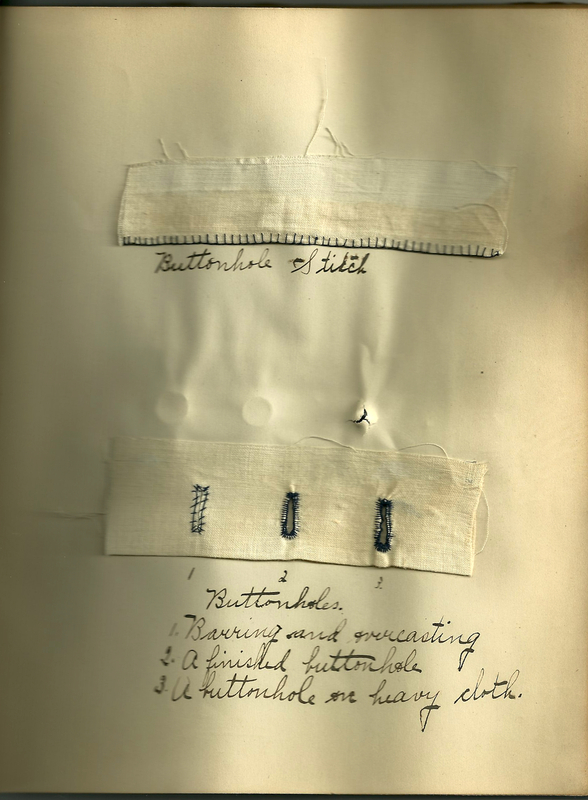 All buttonholes were made by hand in 1907 – and Ethel had to learn how to make them as well. She finally spelled “stitch” correctly – although it looks like it was struggle! 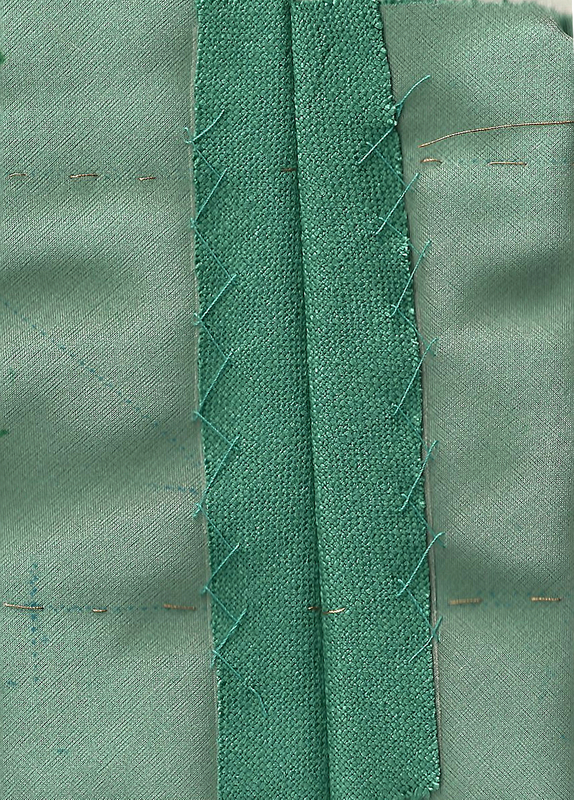 Here is a gathered seam. 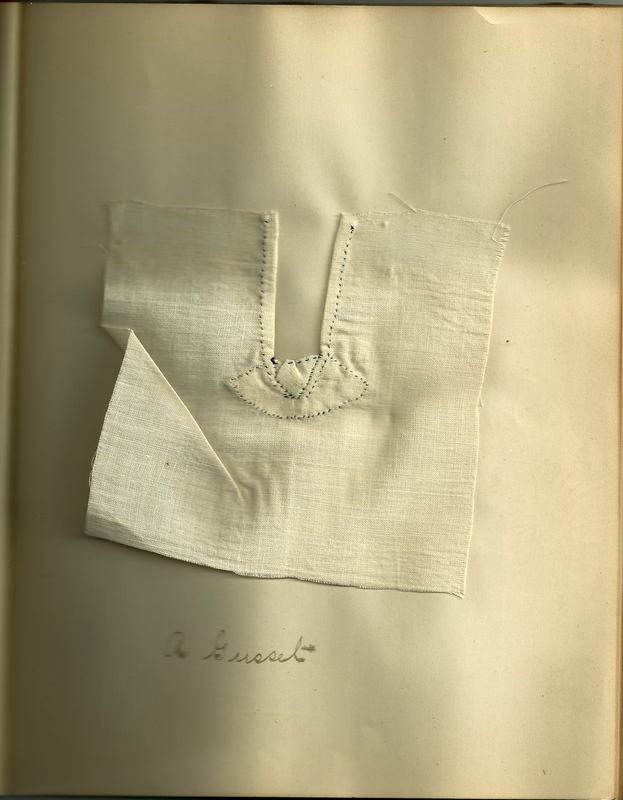 Here is Ethel’s example of Honey-combing or smocking. She even learned how to make a gusset! One interesting omission in Ethel’s book: that catch stitch I like to do so much. Here is one of my seams in my “couture dress” with the seams properly catch-stitched! No matter what stitch you are doing – may it look happy, unpuckered and definitely not home-made! I love handstitching, but like you, the catch stitch is one of my very favorites, tied with the fell stitch! Can’t wait to see your dress from Susan’s couture dress class! I am so enjoying the process of “the couture dress” – and all that hand-sewing suits me quite well! Every young girls may not be interested in learning these stitches, but who do these young girls turn to when stitching needs to be done? It’s quite amazing when you realize that there are many people who can’t sew on a button or do a hem! 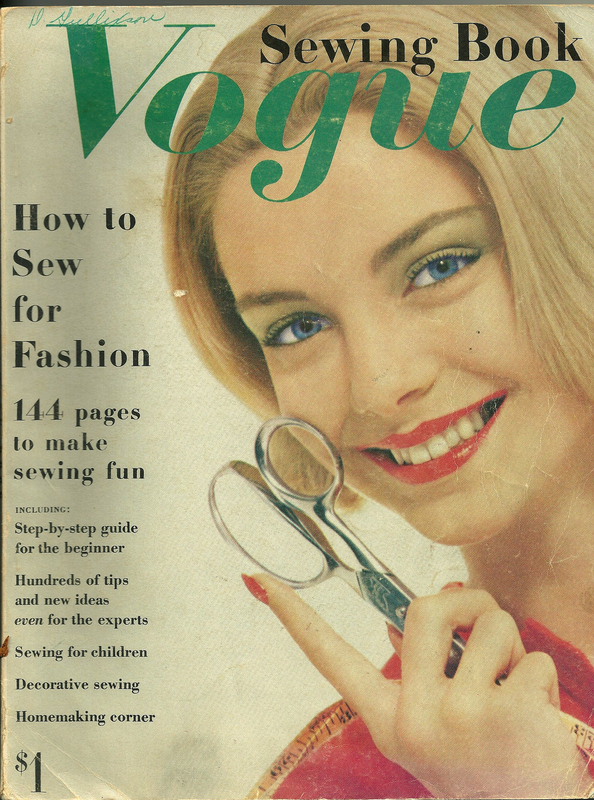 But there seems to be a growing and widespread interest in sewing – and that’s a great thing! I learned most of my basic hand-sewing by experimenting as a kid, but apparently, I did okay with figuring it out because I’ve been complimented many times on my stitches. I didn’t learn the “catch-stitch” until my first job when the costume shop draper/cutter had everyone invisibly hem almost everything using that stitch (in theatre, people usually call it a “cross-stitch”). I wish I had had a stitch book to look at when I was a kid! I would have loved to have had the chance to make my own “stitch book” when I was young. The emphasis was more on learning to use the sewing machine, which, of course, was equally exciting! Me too! I think I was only allowed to handsew for the first year because my mom was a little afraid to let me use the machine at first. When she saw that I didn’t poke myself full of holes with a hand needle, she finally felt comfortable letting me try the “power tool”, hehe. Louisa May Alcott (1832-1888) in her book Eight Cousins (1875) writes in Chapter 16 (Bread and Buttonholes) about 13 yr. old Rose learning how to make bread and buttonholes from her great aunts. I love Ethel’s book! I have a similar one from a teen girl of the 1930s. Those skills were very valuable. I wish I could show every page from Ethel’s book – all 35 of them! What a treasure to have her sewing book. That’s awesome!!!! I was fortunate enough to be taught to sew by hand by my grandmother when I was very young (6). What I would give to have a “stich” book by my grandmother or great grandmother.. Both were very good at what they did. You are so very fortunate to have your husband’s grandmother’s book. My husband’s grandmother’s stitch book could have easily been put in the trash heap, so I do, indeed, feel so fortunate to have it. I intend for one of our granddaughters to have it eventually. It is representative of a life passage that is now obsolete but which needs to be recognized and remembered as one of importance and value. Thank you for your lovely and touching comment. How fascinating to have this! Such an example of how our times have changed…..maybe not so much for the better in terms of our ‘disposable ‘ clothes culture. Think how proud your grandmother in law would be, knowing you are sewing and cherishing this book! I feel very fortunate to have this sample book. What has impressed me the most is how comprehensive it is, including stitches and techniques which are really couture in practice. Thank you for your comment, Linda!